There’s life in the Toronto Blue Jays, who would have guesses? They’re heading into game 5with the momentum of finally beating the Cleveland Indians, who know hold a 3-1 ALCS lead, but suddenly showing that their pitching and even their bullpen aren’t bulletproof. Maybe it all came down to playing Andrew Miller or not. He didn’t, and Cody Allen didn’t play too. In their absence, Bryan Shaw didn’t look good, and neither did Dan Otero and Mike Clevinger. On the other side, Aaron Sanchez was terrific, and the Blue Jays got their first solid bullpen appearance in this series, with Marco Estrada returning to the mound for game 5, hoping things go better than they did in his first appearance in this series. Previous game: The Blue Jays hit up Corey Kluber early to take a two run lead, and ended up winning 5-1 when the Indians bullpen couldn’t match what the Blue Jays had for them. 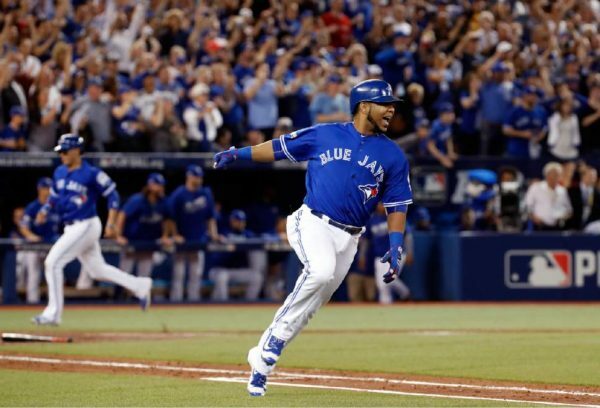 Josh Donaldson started the game with a home run, Ezequiel Carrera followed with an RBI single and later in the game Edwin Encarnacion and Kevin Pillar added to the score. Aaron Sanchez gave up just one run, both Brett Cecil and Roberto Osuna struck out 2 in their relief innings, while the Indians had only two hits the entire game, suggesting their pitching crew needs to be almost flawless most times in order to win. Starting pitching: Ryan Merritt spend most of the season in Triple A. The 24 year-old rookie has only 11 major league innings this season, which means the Indians are ready to go with some heavy workload to their bullpen. Merritt did look good for most of his time on the mound in the regular season, posting a 1.64 ERA, striking out 6 batters and not walking a single one. It’s hard to say what this means for a playoff game in a hostile Toronto atmosphere, but the Indians don’t really have a choice considering all their rotation injuries. For the Blue Jays, it’ll be Estrada. He has played well in both postseason games, with 16.1 innings combined, including a complete 8-inning game in game 1 of the ALCS, which ended in a 0-2 loss. He’s given up only 3 runs for a 1.65 ERA, and it seems that if he gets the run support, he should be able to handle the Indians lineup for at least 7 innings. Francisco Lindor hit a two-run homer off of him in game 1 of the series, making him the sixth of the current Indians player to have a homer vs Estrada. It’ll be interesting to see how soon the Indians turn to their bullpen in this game, and whether or not they’ll be able to generate some offense. They were put in a position that allowed them to have Miller and Allen rest up a little bit, but allowing the Blue Jays hitters to get some momentum going is probably not what they had in mind, so it won’t be surprising, unless Merritt does shockingly well, to see Miller take the mound very early in the game.